The co-founder and former guitarist of the popular world-famous Christian rock band the Newsboys has officially renounced his Christian faith and is calling members of the current version of the band hypocrites. George Perdikis, who founded the chart-topping Christian band in 1985 with his friend Peter Furler, wrote an op-ed on Wednesday published by the website Patheos explaining how he transformed from a guitarist in one of the most popular Christian rock bands of all-time to a cosmology-enthused atheist. "I always felt uncomfortable with the strict rules imposed by Christianity. All I wanted to do was play rock and roll," Perdikis wrote. "And yet, most of the attention I received was focused on how well I maintained the impossible standards of religion. I wanted my life to be measured by my music, not be my ability to resist temptation. "And I'm now an atheist," Perdikis asserted. Perdikis piece began by explaining the origins of the band, which originated in Queensland, Australia, and how it became a "christian rock band." After Perdikis was kicked out of his high school and was sent off to a Christian school in Bethesda in 1981, he met Furler, who was a drummer, and jammed with him in a garage for years. When Furler's family moved to Queensland in 1983, Perdikis would travel up the coast to play with Furler on most weekends. Perdikis later invited his other friend Sean Taylor, who played bass, to join the two in their jam sessions. Perdikis would later invite a vocalist, John James, to join the band. Although the band initially started out playing cover gigs in pubs, churches, parks and other small gatherings, Perdikis said the "band evolved quickly" and he ended up quitting his job in the Air Force and moved in with the Furler family in order to concentrate solely on music. As the band began to write its own songs and practiced more often, the members decided to describe it as a "Christian rock band" out of respect for Furler's parents, who were "fundamentalist Christians." "The choice to become a 'Christian Rock Band' was heavily influenced by Peter's parents, Bill and Rosalie Furler. As fundamentalist Christians, the only acceptable form of music was the kind that worshipped God," Perdikis explained. "Bill and Rosalie were like second parents to me and, for that reason, I never questioned their advice." As the band practiced and wrote more songs, they decided to call themselves "the Newsboys." "We might have been classified as Christian Rock, but, musically, I felt we were as good as any secular band," Perdikis asserted. The Newsboys' big break came in 1987 when they were asked to participate in an event with the Christian band Whiteheart. Whiteheart liked the Newsboys' music and later that year the band was recording their first album, "Read All About It." Perdikis co-wrote the band's first two albums and toured with the band up until he left in 1990. He would later get married, teach guitar and have two daughters. He explains that after leaving the band, he began to live a life that separated him spiritually from the Church, as he began to search for what his beliefs truly were, admitting that he never really thought much about what he truly believed. "I learned so much and was blown away by all the amazing scientific discoveries," Perdikis said. After his marriage fell apart in 2003, Perdikis said he did not turn toward God, but instead turned his attention toward psychology. About four years later in 2007, Perdikis had renounced his Christian faith. Perdikis continued in his op-ed by criticizing the Christian music industry. "The Christian music scene is populated by many people who act as though they have a direct hotline to a God who supplies them with the answers to the universe," wrote Perdikis. "There seems to be more ego and narcissism amongst Christian musicians than their secular counterparts." He did not shy away from attacking the current version of the Newsboys, which does not include any of the band's original members. 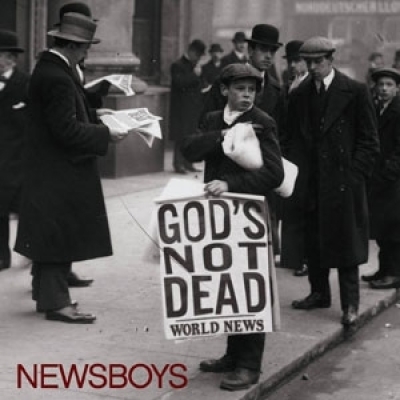 "Recently, the Newsboys were featured in the movie God's Not Dead. The movie demonstrated the pervasive attitude of Christians. The demonized everyone while giving pass to their own particular brand of Christianity, making themselves look like white fluffy white angels with perfect, synchronized lives," Perdikis accused. "The truth is — from someone who knows what went on then and what goes on now– the Newsboys aren't as holy as they profess. Instead of wearing a mask of 'righteousness,' they should acknowledge that they are struggling as much as everyone else."